I know it's after Thanksgiving but I received so many emails this year for my Crock Pot Stuffing, I decided it's better late then never. 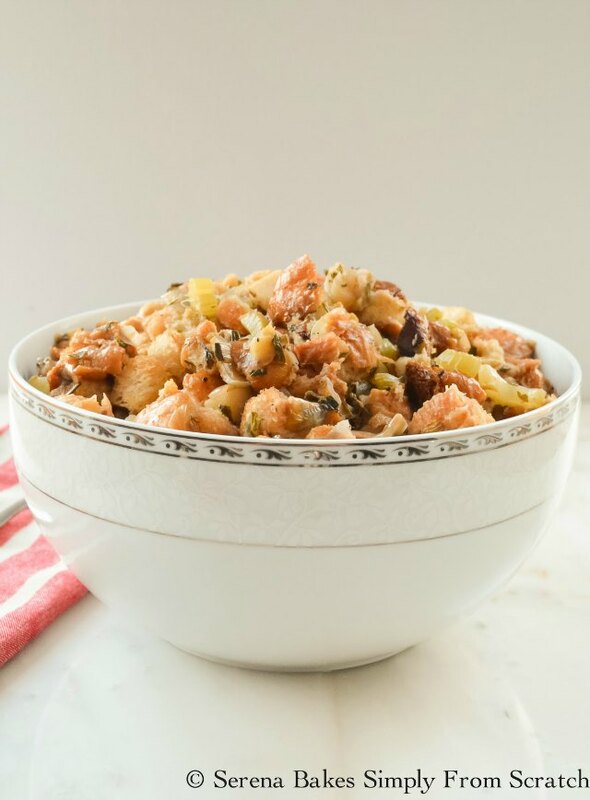 We've actually enjoyed Crock Pot Stuffing a few times in the last month or two, with plans of posting the recipe, but we always seemed to run out of daylight before Colt could capture a finished photo. Luckily the light was perfect on Thanksgiving, and he captured a few shots before the stuffing went to the table. I started making stuffing in the crock pot on Thanksgiving 2 years ago following my car accident. I had a hard time rolling out of bed extra early that day, and a stuffed 30lb Turkey could have taken an extra 2 hours leaving dinner long over due. I had plenty of kitchen help between Colt and the kids, but they needed my direction. When you're living in chronic pain you start to prioritize what really matters in the day, and on that particular day I knew I needed the extra sleep, after a night of tossing and turning. From past experience I knew cooking the excess stuffing in a casserole dish never created the moist flavorful stuffing that came from the Turkey, and required valuable oven space. It was dry, and no matter what I did it just wasn't my first choice, so I decided I would test out the slow cooker, to not only save oven space, but on time. After 15 years of Stuffing the Turkey, my ways have been eternally changed. Not only does the Stuffing smell amazing, but you won't miss the flavor, with a few simple tricks. It's moist and flavorful, with a lightly crispy edge similar to dressing. 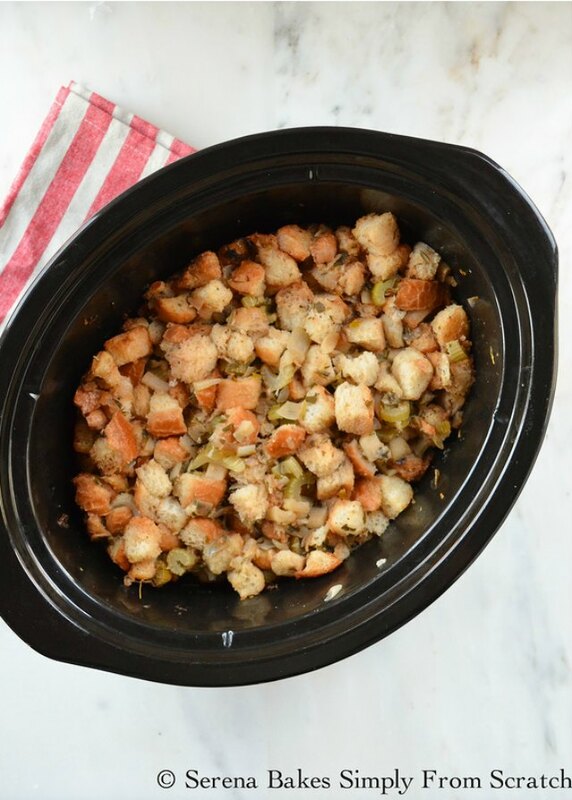 Crock Pot Stuffing really is the best of both worlds. 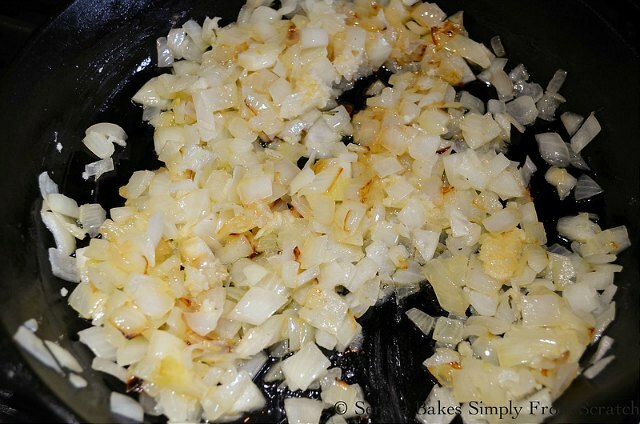 In a large skillet melt 1/3 cup Butter and sauté 2 whole Medium Sized Diced Onions, until onions start to caramelize. Cook until garlic and herbs become fragrant. Stir in 1 1/2 cups Dry White Wine like Pinot Grigio or Chardonnay, and bring to a simmer. Cook off the alcohol for about 5 minutes until the wine has reduced. Stir Vegetable/Wine mixture into 12 cups Dried 1/2" Bread Cubes until well combined. Then slowly stir in between 2 1/2-3 cups Turkey or Chicken Stock until bread is lightly moistened but not soggy. Taste stuffing and add Salt and Pepper if needed. Butter bottom and sides of a 6 quart Slow Cooker and add stuffing mixture. Baste stuffing with Turkey Drippings once they become dark or additional broth about 3-4 times as it cooks. If bread starts to become too brown around edges turn slow cooker to warm until ready to serve. 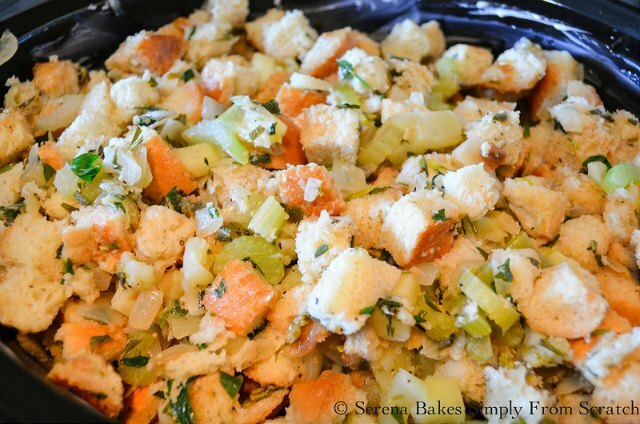 The secret to really good Crock Pot Stuffing is not over moistening the bread when adding it to the Slow Cooker so it steams as it cooks and the additional basting of juices to not only reach the perfect consistency, but the additional flavors of the Turkey. Serve stuffing out of the Slow Cooker or place in a pretty bowl. This stuffing can also be used inside the Turkey just baste the opening with the stuffing as the bird cooks. Either way you can't go wrong. 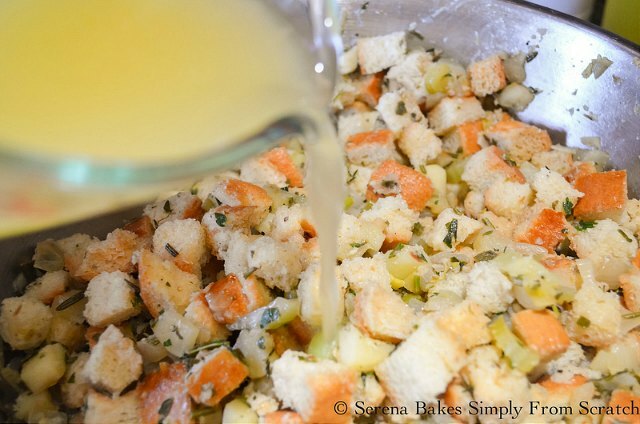 Crock Pot Stuffing recipe is packed with flavor from fresh herbs and wine. 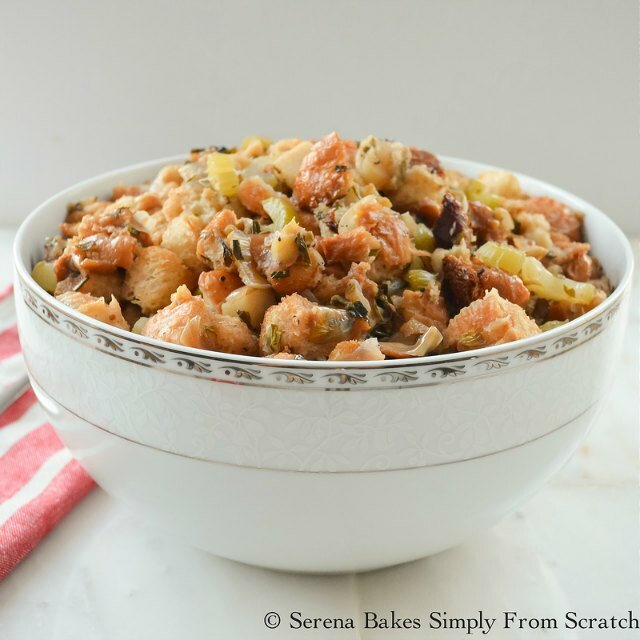 Making it a must for Thanksgiving from Serena Bakes Simply From Scratch. Preheat oven to 300 degrees and turn oven off. Add bread cubes in a single layer on a cookie sheet. Stir bread cubes every so often and reheat oven as needed until bread is totally dry. Store bread cubes covered in a large bowl or container covered until ready to use. Bread Cubes can be dried a week ahead of time. Don't forget the bread cubes are in the oven! It helps to place a note over the thermostat with a reminder to remove before starting. Grease a 6qt Slow Cooker well with butter. Set aside. In a large skillet melt butter and add onion. 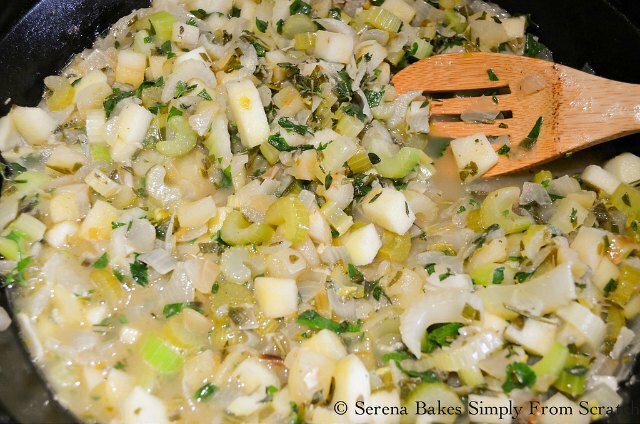 Cook until onion starts to caramelize. Add garlic, celery, apples, sage, thyme, rosemary, parsley, salt and pepper. Cook until garlic and herbs become fragrant about 2-3 minutes. Stir in white wine and bring to a simmer. Cook for about 5 minutes until wine has reduced. Toss cooked vegetable mixture with dried bread crumbs until evenly coated. Stir in enough stock to moisten bread crumbs being careful not to add too much. Bread should be lightly moistened but not soggy. Taste stuffing and add additional salt and pepper if needed. Place stuffing in greased slow cooker. Cook on low for 6-8 hours or high 3-4 hours. Baste stuffing with turkey drippings or additional broth 3-4 times as it cooks. If bread starts to become too brown turn slow cooker to warm until ready to use. Calories are estimated using my fitness pal. This is the only way I've made stuffing. Love the crock-pot, and it frees up the oven!! It would be nice if there were a Print button on this page. Do I use my lid on the slow cooker? I actually hate my slow cooker because everything I try to cook gets so soggy. And I don't like soggy stuffing for sure. Hi, Can you tell me whether and how stuffing can be made the day before? Is it one of those those things that gets better after setting over night in the 'fridge, or does it have to be served immediately? If I can do it the day before, how to I heat through without drying? Thanks! I like the flavor contrast with the herbs. If you aren't big on apples you can skip them. Hi! I'm making this for thanksgiving but I need more than 12 servings! Can I just double the recipe and then how would the cooking time adjust? To make the night before would you mix it all. Refrigerate. Then cook in am? Or wait and mix and cook in am. I cooked veggies etc already but haven’t mixed bread in. Thanks. Hi Serena, I want to make this but would rather bake in the oven to get that crisp on the top layer. Is there any changes I should make to the recipe? This stuffing is delicious! I can't wait to serve it for Thanksgiving this year. Thanks so much for the recipe!